From its vantage point near Venus’ orbit, Sentinel will have a clear view of Earth’s orbit while looking away from the glare of the sun. 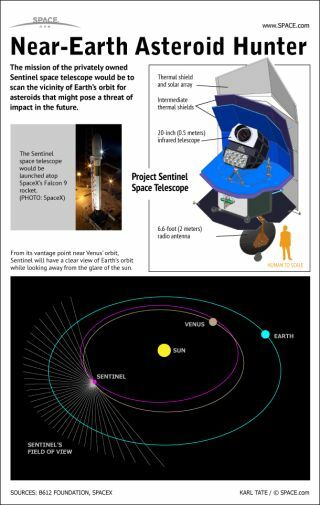 The privately funded Sentinel project would launch a space telescope into a solar orbit at about the distance of the planet Venus. Once in place, Sentinel Space Telescope would be pointed away from the sun and would start scanning the area around the orbit of Earth for undiscovered asteroids that might be on Earth-impacting trajectories. The current plan is to launch Sentinel in 2016 aboard SpaceX’s Falcon 9 rocket. The spacecraft would build on technologies designed for NASA space telescopes such as Kepler and Spitzer observatories. Sentinel uses a 20-inch infrared telescope to scan for moving objects that could be asteroids in near-Earth orbits. Sentinel would be the world’s first privately funded deep space telescope. The B612 Foundation is dedicated to protecting Earth from potentially devastating asteroid impacts. The group is named after the asteroid home of the hero of “The Little Prince,” a children’s book by Antoine de Saint-Exupéry.